It was unusually difficult to pick only one place I liked most in February. 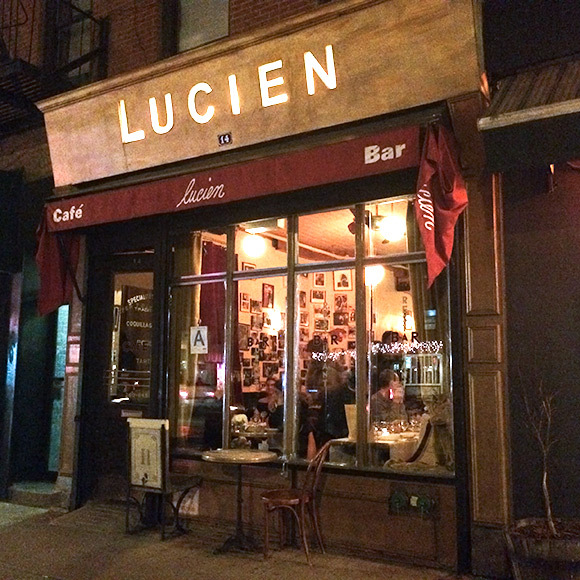 At the end, I selected Lucien, a French Bistro in East Village/Lower East Side. The bus stop I often use is located in front of the restaurant so I passed by Lucien so many times but I have never thought about going there. There is no reason not to go. I knew the place is ALWAYS packed with people so it must be decent, but I've always had other places to go. 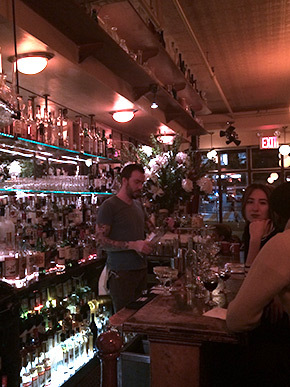 I have been in NYC long enough to realize it was time to discover some of the neighborhood gems which I had ignored. So finally I made a reservation for dinner on one of the coldest nights this winter. Luckily, it is a neighborhood restaurant! Only five minutes walk! And I am glad I did because it was a great evening. 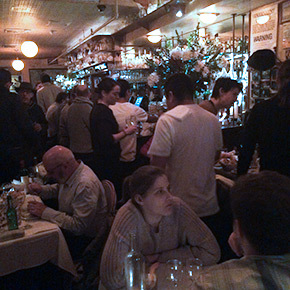 Lucien is not a big place and just like other bistros in the city, you don't get much space between you and guests next to you. 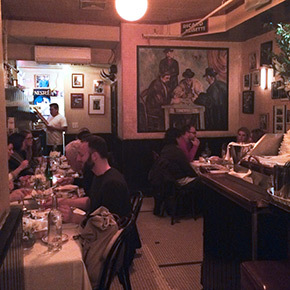 But it is cozy and has a classic bistro ambience. I made a reservation so my husband and I could sit at a table right away but we decided to stay at the bar which was more relaxed and comfortable. The bartender was a very nice guy and he tried his best to serve us timely even though he had to take care of all the drink orders by himself. I had a very nice market green salad first. A market green is such a simple thing you can order and most of the restaurants has it on their menu but how many places can make it right? Not many. The majority of them put on too much dressing until it is too tart and soggy to eat. Lucien did a beautiful job on it. One thumb up. Next I had another bistro classic, duck liver mousse. It was very silky, buttery and had a nice touch with pink pepper corns. The main dish I chose was the Canard aux Figues et Navets (Magret and confit of duck on a bed of spinach, figs, and turnips). It comes with one tender leg which pulls apart from the bone and many slices of breasts on a bed of spinach and turnips. The sweet figs were a wonderful companion for the duck. Another thumb up. 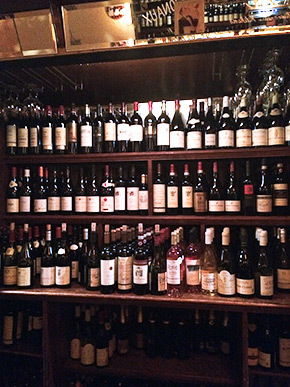 The cocktail was great and they have reasonable and good wine selections to go with your meal. I was not sure which glass of red to order but the bartender helped me and even let me try his suggestion despite the fact that the place was chaotically packed. And indeed, it was good. Only thing that I didn't like was the bread but that was actually a good thing so that I didn't make myself full before the meal started. The price was between average to expensive. Not everything is expensive and some of their menu items are very reasonable. So it depends on what you order. Our duck dish was $36 and I think it was worth every penny. I would not say Lucien blew my mind but the service was great, the food was delicious and all the patrons there seemed to be happy. It may not be the best bistro in the city but it was definitely one of my favorites in my neighborhood.